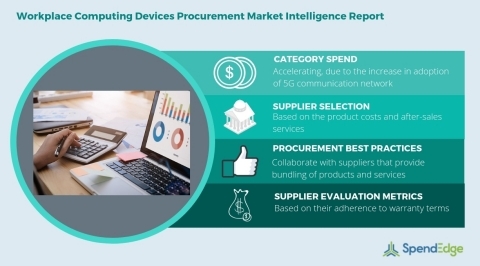 LONDON--(BUSINESS WIRE)--SpendEdge, a global procurement market intelligence firm, has announced the release of their Global Workplace Computing Devices Category - Procurement Market Intelligence Report. Organizations are increasing their expenditure on a range of workplace computing device to improve the productivity of the employees. This will act as one of the primary growth drivers for this market. Leveraging 5G network in the business infrastructure will necessitate procuring portable devices such as laptops, smartphones, and tablets which will consequently accelerate the category spend momentum. Get the Free Sample copy of this market intelligence report on workplace computing devices to get insights into strategic sourcing objectives and pricing strategies. In the global market for workplace computing devices, the US alone account for almost 80% of the category spend. Adoption of cloud computing has improved the security standards in organizations that are enabling them to allow employees to securely use portable devices such as laptops, tablets, and smartphones. This is contributing to the category spend growth rate in the US. APAC is witnessing a flux of projects outsourced by the global companies who are setting up their office infrastructure in the developing nations. This will consequently accelerate the category spend growth rate in the region. Insights offered in this workplace computing devices sourcing and procurement report include supply market forecasts, strategic sourcing, pricing strategies, and category management insights. Such insights are relevant for both the buyers and the suppliers who seek a risk-free and a cost-effective procurement strategy. The category spend segmentation done in this market intelligence report will guide the investors in identifying the best investment areas as well as help them in identifying cost-saving opportunities in the market. Request free customization of this market intelligence report on workplace computing devices to get information tailored to your every requirement. “Collaborating with service providers who offer product and service bundles can reduce excess spend,” says SpendEdge procurement expert Tridib Bora. Purchase the full market intelligence report on workplace computing devices here! SpendEdge’s procurement market intelligence reports for the information technology category provide detailed supply market forecasts, pricing strategies, strategic sourcing insights. Such information will help procurement managers as well as the suppliers to determine the total cost of ownership and change their procurement strategies accordingly. Additionally, SpendEdge’s reports provide category management insights and information on the procurement best practices for the category. Do you purchase multiple reports in a year? Our subscription platform, SpendEdge Insights, provides ready-to-use procurement research reports for multiple categories. Now access the latest supplier news, innovation landscape, markets insights, supplier tracking, and much more at the click of a button. Start your 7-day FREE trial now.